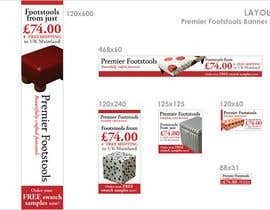 We are looking for 12 classy, eye-catching banners in a variety of sizes with a good call to action for our affiliate scheme. Hello, I've updated the pictures for the 468x60 and 120x240 banners. Thanks! I just submitted some banner designs, one for each size given. I have given two for the 120x600 banner. The remainder will be uploaded soonest. Hi, you are correct in your understanding. I like your work but I don't think you need to include the text with the product name as the font is tiny. In fact I would ask that where possible you try to increase the font sizes a little on the small text such as the free delivery text on the 125x125 banner. Perhaps you could try to utilise the space given up by removing product names? Overall though they are great quality banners. I have just made a general price reduction on the website so our prices now start from £74.00. Could u pls Explain more about the 12 banners? You want 12 different banners or 2 different banners in 6 sizes?? Yes, it is a bit vague, I apologise. I need 12 banners, 6 of a similar design in the sizes requested. I also need another 6 of a different design again in the sizes requested. So two groups of 6 banners, each group of a different design/style but not all 6 banners have to be exactly the same within a group as size will dictate that this isn't possible. 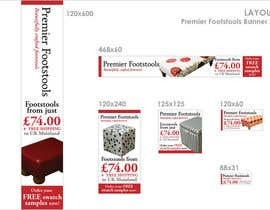 Have a look at http://www.premierfootstools.co.uk/banners.html and you will see what I am looking for. This page shows 6 different size banners but similar in terms of colour etc. From you I need two more groups of 6. I hope this helps. 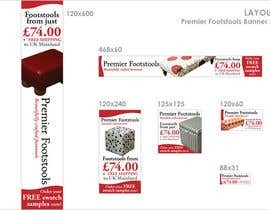 Hello Premier Footstools, can you please advise what fonts are used, if you require them to be exactly the same as those on the website? Thank you. Also would you want your logo on the banners? If so, please provide on your listing for us to download, thank you. Revival565 BT is the font, you don't need to use our logo, just try to use our name in the correct font and style as per our website. I want to include good calls to action and the fact that we have FREE UK Shipping and a FREE Swatch Service. 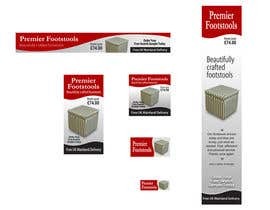 Take a look at http://www.premierfootstools.co.uk/banners.html to see my efforts. Pixels of course! Do you really think I want a web banner 120 inches by 600 inches? Even cm would still make the smallest 88cm x 31cm which is as big as a small child.